Summary: Who do you trust, who do you love, and who can be saved? It is 1943—the height of the Second World War—and Berlin has essentially become a city of women. Sigrid Schröder is, for all intents and purposes, the model German soldier’s wife: She goes to work every day, does as much with her rations as she can, and dutifully cares for her meddling mother-in-law, all the while ignoring the horrific immoralities of the regime. But behind this façade is an entirely different Sigrid, a woman who dreams of her former lover, now lost in the chaos of the war. Her lover is a Jew. A high ranking SS officer and his family move down the hall and Sigrid finds herself pulled into their orbit. A young woman doing her duty-year is out of excuses before Sigrid can even ask her any questions. And then there’s the blind man selling pencils on the corner, whose eyes Sigrid can feel following her from behind the darkness of his goggles. One of the best books that I've read in 2012 is, without a doubt, CITY OF WOMEN by David R. Gillham. I hesitate to even try to write a review for this incredible novel because I know that my words won't begin to do justice to this story. I began this book on my way to New York for BEA, and I have to say that as much as I love hanging out in the city, I almost didn't want my train ride to end. I was absolutely, positively blown away by CITY OF WOMEN, and I couldn't help but talk about it... a lot during my BEA trip. Kathy (aka Bermudaonion) was probably sick of me mentioning just how fantastic this book was. I told everyone that it's a must-read novel and it truly is an incredibly, not to mention, well written story. In fact, I think I said those exact words to the author when I met him (and probably more than once) -- I was a little awestruck! 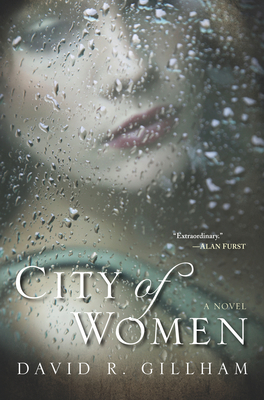 CITY OF WOMEN begins in 1943 Berlin when all of the men are at war -- hence the title, "City of Women." Sigrid's husband is fighting for his country, while she is working and living with her difficult mother-in-law. She is surrounded by people who are on the verge of breaking down whether it be because their loved ones are away, they fear for their lives, or they are afraid they will fall under their friends' and neighbors' suspicions. Sigrid manages to find a way to escape from the drudgery when she begins a love affair with none other than a Jewish man named Egon. Egon involves Sigrid in carrying packages for his black market business before he eventually goes into hiding. Meanwhile, Sigrid finds herself becoming involved in an underground network to protect Jews. Despite being warned not to become to emotionally involved, Sigrid begins to suspect that the woman and children that are being hidden might be the wife and children of her missing lover. When Egon returns to her, Sigrid doesn't tell him what she suspects (I know, right?) Rather, she hides him in an apartment (close by to her husband who has returned injured from battle as well as her "new" German lover) and does her best to protect him. Sigrid finds that her once simple life has turned extremely complex given all of the new relationships (both romantic and friendly ones) she's formed. She's unsure whom she can trust and she doesn't always realize what's right from what's and wrong. Things continue to escalate for Sigrid throughout the novel until the very dramatic and very surprising ending! I told you this story was complex!!! But, at the same time, it is so worth reading. There are just so many wonderful things that stood out to me, but I am only going to touch on a few. I think the rest are best discovered by the individual readers! Plus, I want to be certain that you will pick up this novel! One very special thing about CITY OF WOMEN is that it was written by a man. I know that might not be the most politically correct thing to say, but I truly felt this way. My initial impressions of this novel were that the author managed to capture the essence of Sigrid, as a woman, perfectly. I was almost taken aback by how well he developed her character and demonstrated her passions to the reader. I was equally blown away by how the book turned into a suspense story. I definitely wasn't expecting the story to take the turns it did and I absolutely loved how intriguing Sigrid's actions and thoughts became. I quickly got caught up in the various relationships she had formed, and along with Sigrid, I was wondering who was trustworthy. The story actually made me uncomfortable at times (in a good way), and I can pretty much assure you that I was on-the-edge of my seat for hundreds of pages. Another wonderful things about CITY OF WOMEN was how well the author brought 1943 Berlin to life. His descriptions of the city were AMAZING, and I could visualize just how dreary and empty the city was. In addition, I appreciated not only how he captured the look of the city, but also the feel. The way he described the individuals' paranoia and suspicions really reinforced just how much the war affected the citizens of the city. Then, there's Sigrid -- one of the most complex characters I've encountered in recent memory. I'm not entirely sure I can say that I liked her, and I can assure you that I didn't like her for much of the novel. But the moral ambiguities that she demonstrated most definitely made me appreciate her character. And what I found strange is that, while I might not have always liked her or her actions, I did feel compassion towards her. She was so very human, weakness and all; and I she showed how a very difficult situation (like a war) has the power to make individuals act in very different ways than they normally would. And finally, I'd be remiss if I didn't mention just how beautiful and powerful Mr. Gillham's prose was. CITY OF WOMEN is his debut novel and I cannot believe that this is his first book. This guy has major writing and storytelling skills. The story line itself is just wonderful and came together perfectly, and his descriptions are also so vivid. But it's the themes he presented in the story -- good versus evil, moral ambiguity, love, passion, loyalty, and deception -- that demonstrate just how powerful his writing really is. I loved how the story played out (especially the ending) and I honestly couldn't stop thinking about Sigrid and her actions for weeks after finishing this novel. No surprise here, but CITY OF WOMEN would make an outstanding book club selection. I sincerely hope this novel is embraced by reading groups because it truly epitomizes the perfect discussion book. There is a reading guide available with thirteen thought-provoking questions; and as good as they are, I'm sure your group will find many other things to talk about as well. Some of the themes you might want to explore include the effects of war, love, friendships, loyalty, secrets, lies, deception, trust, morals, right versus wrong, basic human nature, and passion. CITY OF WOMEN will go down as one of my best reads of 2012. As far as I'm concerned, it's a must-read. Don't miss it! Yes! Absolutely one of my favorites of the year. I remember you raving about this at BEA. I have it in print and audio and was thinking of going with the audio but, since it's complex, I might be better off with the print version. I have not read this one, but it is definitely on my to-read wish list. Good heavens ... if you loved it so much then it's going on my list too! How wonderful to see that you liked this one so much! It's already on my wish list, I've just been waiting to see what people think about it. This sounds fabulous! I definitely want to get to it! Okay, this one is definitely one I'm interested in since I love that setting too. Romance, intrigue, suspense? I'm in! I just started this book today - I'm glad to hear you liked it so much. This book sounds amazing. I love WWII historical fiction and your review has me very excited to read this! I just one a copy of it on audio book and can't wait to listen to it! It's been on my wishlist for awhile and I loved reading your review!